WASHINGTON CITY — A Hurricane City man was arrested Sunday after police found over two pounds of methamphetamine in his storage unit in Washington City. Washington City Police Officer Matt Page discovered 50-year-old David Mangum slumped over the steering wheel of his vehicle with the driver’s side door open, Page wrote in a probable cause statement supporting the arrest. After the officer made contact with him, Mangum said he was just leaving his storage unit and must have fallen asleep. According to the statement, Mangum appeared to be under the influence of a narcotic. Page discovered Mangum had a history of narcotic arrests and also saw there were surveillance cameras on the exterior of the storage unit, so a K-9 unit was called to the scene. Page then drafted a warrant to search Mangum, his vehicle and the storage unit, the statement said. A judge signed the warrant, and it was executed. While searching Mangum, the statement said, police discovered a piece of tinfoil containing suspected methamphetamine. 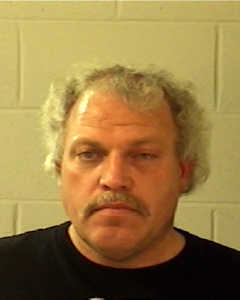 Mangum was placed under arrest at that point and transported to the Washington County Purgatory Correctional Facility. Upon searching the storage unit, the statement said, police discovered a metal safe, which members of the Washington City Fire Department pried open. Inside, police found much more than a piece of tinfoil. Mangum was charged with one first-degree felony for possession of methamphetamine with the intent to distribute and one class A misdemeanor for possession of drug paraphernalia. Because his storage unit was located within 1,000 feet of a drug-free zone, all drug charges against him were enhanced. His bail is set at $25,000 cash-only for the felony charge and $389 cash or bond for the misdemeanor charge. As of this publication, Mangum is still incarcerated at Purgatory Correctional Facility, according to bookings information. YaY! There is more to be found coming in from Mexico. Hate Meth!!! Mexican mafia and drug cartel and their dang drug and human trafficking. Lock up the borders!!! yup, the politics actually support meth trafficking. Go, Hunter, go! Dang tweeker.